A suspect in the stabbing death of a man on La Brea Avenue near Santa Monica Boulevard that raised alarms about safety on WeHo’s Eastside was arrested two days according the L.A. County Sheriff’s Department’s Homicide Bureau. Despite the considerable outrage created by the murder, which led to a special meeting on the Eastside of the city’s Public Safety Commission, the arrest was not announced by the Homicide Bureau. It was first disclosed today by the Beverly Press. Lt. Joe Mendoza of Homicide Bureau said the suspect is Carl Edwards, 45, who he said is transgender and identifies as a woman. 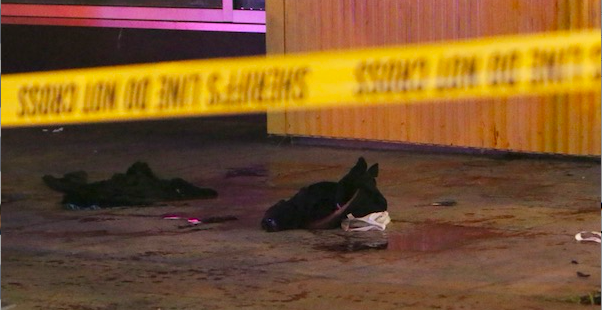 Edwards and the victim, Bernar Jivan Arlain, 32, an African-American man, had been dating and had gotten into an argument before the stabbing near the McDonalds restaurant on La Brea. Edwards was arrested in downtown Los Angeles. Both Edwards and Arlain are believed to be homeless. Edwards faces on charge of murder and is being held without bail. It seems as though Tiffany Pearson felt compelled to provide an explanation of events. Now correct me if I’m wrong, he was stabbed which lead to his death. That is the same thing as stabbed to death. Sounds like you have inside information on this heinous crime which is possibly the result of DV. The question is on who’s part. If it was self defense then the suspect shouldn’t have ran. The suspect should’ve called 911 then maybe to city wouldn’t be in such disgust about the situation. L.A. County Sheriff’s Department is a total joke. Talk about a third-rate policing group. Scandal-ridden, just look at the pathetic Sherriff Baca. What I want to know is what does the LACS Dept have on elected officials that forces West Hollywood to keep this totally inept group policing West Hollywood? Dump them? WEHO could contract with other policing departments in outlining cities to form a WEHO Police Department. Again, the LACS Dept has had a history of corruption and there is no reason to keep the third group policing West Hollywood. Why do you want a “mugshot”? The Suspect is behind bars. She is innocent until proven guilty. Law Enforcement, for whatever reason they had, delayed releasing basic information including that the suspect was in custody. WEHOville did a great job getting the story out there as fast as they could. Henry Works Very hard and Diligently to inform the Community about what’s going on in an unbiased way. His News Platform is the only one I know which allows readers to comment in real time on stories. Give him a break! He’s doing a Great job. WEHOville is the first thing I read when I get up in the morning and the last thing I read before I go to bed, and I READ A LOT. Be Grateful we have WEHOville….and NO I AM NOT AN ADVERTISER ON WEHOVILLE and I do not know Henry Personally. Please get us a mug shot. Would be great if you guys started doing a little more investigative reporting. Maybe then people would agree to pay your subscription fees. I also want to publish a mug shot. But it isn’t easy. You’ll note that despite the controversy sparked by this crime, the L.A. County Sheriff’s Department didn’t bother to announce the arrest of the suspect until two days after it happened, and that’s because the Beverly Press made a call. And “you guys” is me, with the help of a couple of part-time freelancers. We’re hoping our subscription campaign will allow us to hire someone else to expand our staff of one to two! I’m glad that we don’t have to worry about a killer on the streets with a knife, but I also feel sorry for both people. It’s very sad and unsettling that relationship issues can escalate to this level. Domestic Violence in any form is a terrible thing. she’ll have a place to sleep for the next few years.